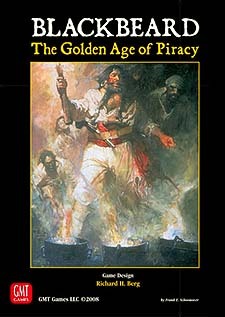 Blackbeard: The Golden Age of Piracy lets you guide the fate of the pirates who sailed the seas in the late 17th and early 18th centuries. Each player takes the role of one or more pirates, attempting to become rich, notorious, and feared before (hopefully) retiring and living off his spoils and his reputation. The targets for pirates are mostly Merchant Ships, laden with valuable booty and passengers. The booty is for the taking; the hostages are useful for ransom or information. Taking the ships is the easy part, for the seas are treacherous. Pirates will find British warships, King's Commissioners, and hostile port Governors hindering their progress and threatening them with death. And then there are the events - some random, some nastily put in play by the opposing players, all of them providing their own sharp challenges.